Developing a successful indie game is not unlike exploring a lost world; the venture can transport you from the glorious high of stumbling upon a lost city to the humbling experience of not being able to enter. Tom is one game Dev on Steemit who knows this saga well. After a year of sluggish interest, gamers flocked to his lost worlds survival game, but now he is ready to abandon not only the game but his studio as well. Operational expenses for the mid-budget sleeper have eaten away at his project funds. This would have been the end of Tom’s saga — another gaming post mortem to dissect, only to find a decent portion of developers fail to even recover their development costs. But rather than fold shop, Tom is following his peers over to gaming platforms running on the decentralized platforms that utilize distributed ledger technology and blockchain. Instead of running on centralized servers, dApps run on open source, decentralized peer-2-peer blockchain networks, allowing Tom to sell his game assets directly to users. With no central administrator to take huge commissions, value created in the network is shared among the gaming platform developers and players. Content platforms such as Youtube, iTunes and Amazon, meanwhile, are charging 30 percent or more in commissions while raising the bar before content producers can receive any kind of revenue (e.g. after 10,000 views on Youtube). Tom’s downfall was having to pay these platforms high commissions on declining revenues for game assets. The blockchain seeks to wrest control from these powerful centralized e-commerce marketplaces seeded with billions of dollars in dot-com financing, and give that control back to users and developers. Tom’s dilemma is how to value and choose the right gaming platform on the blockchain. The number of decentralized apps (DApps) is expected to more than double from under 1,000 in 2017 to over 2000 in 2018. Dozens of gaming dapps have launched on the blockchain over the past year alone. These dapps mostly use economic models and software protocols whose economic viability have not yet been proven, portending a great reckoning ahead. Some, no doubt, will fail to create value. Which of the gaming platforms is going to incentivize players to play Tom’s games, and create and distribute enough value among platform users to make his game viable? A dapp network in which value creation is evenly shared among participants, network effects play an important role in valuation. Also known as decentralized autonomous organizations (DAOs) — organizations whose operations are encoded in smart contracts running on the blockchain — dapps are postulated to one day provide more value within their network than a multinational company. That future is not far off. Some dapps will grow to dominate their space — future Amazons of travel, gaming, ride-sharing, and so on, all running on decentralized apps. Meanwhile, large enterprises are transitioning business functions to dapps running on blockchains (e.g., payments processing, supply chain management, etc.). Unlike investing in a company, one does not invest in shares in a dapp but in tokens distributed among many token holders. Like dapps that run autonomously with no controlling authority, the majority of tokens are not controlled by a central authority. Less than a majority share of tokens are typically held to compensate the founding team (about 20%), and support developers, operations and marketing. A dapp, therefore, creates more shared value, and transfers this value among parties through consensus rather than a centralized authority. By investing in a gaming platform token, Tom will invest in the shared infrastructure and receive an equal share of the revenue. Meanwhile, the lower barriers to entry — whereby tokens can buy shared ownership and equal voting rights in a dapp — will stimulate usage of these platforms. Value on this network is reflected in the value of the currency of this micro economy. Activity on dapp networks is incentivized and engaged by cryptographic tokens — the currency of the token economy. These tokens are used to value the network. A cryptographic algorithm is used to verify value on a node (generally through proof of stake or proof of work). This value ultimately depends on the protocols used to incentivize and reward platform users. Currently, a high fee per transaction makes micropayments for a song or a game token impractical. But that may eventually change. How is Tom to decide to which platform to take his digital game assets? There are a number of variables that may help him decide. Tokens — the fuel for the platform and the means to value a token economy — can have different functions. As the dean of valuation, Aswath Damodaran notes, it is important to distinguish between a cryptocurrency, which cannot be valued, and a cash flow generating asset such as a Dapp, which can be valued. Serve as a store of value as the currency, for example, for Type I Dapps (e.g., Bitcoin or Litecoin). Currencies are valued relative to each other. The Bitcoin and Litecoin Dapps do have a value beyond a store of value as a payment service. Have a utility function such as Type II and III apps (e.g., ETH providing access to the Ethereum software layer for Dapps). Type II Dapps add a software layer to Type I Dapps to provide advanced functionality upon which Type III apps are developed. Be backed by assets (e.g., ATLANT shares in real estate assets or WePower (WPR) selling renewable energy production). Whereas Type I Dapps act as an OS and Type II apps a software layer, Type III apps provide utility through products and services. The ICO or initial coin offering, akin to an IPO, plays an important role in giving a token a market price. Investors, however, have the highest appreciation potential by investing in the ICO when the market value is the most difficult to establish. The pre-sale, often only open to institutional investors, provides the highest discounts on tokens. Dapps aspiring to run true meritocracies such as the cross-chain cryptocurrency Metronome and payment service Bulleon are leading the trend in opening up pre-sales to all investors. But these aren’t the only methods of distinguishing between good dapps and great ones. For Type I and II tokens with no tangible assets, network effects have a greater influence on the valuation. Absent assets and confidence in a platform play a significant role in determining value, and confidence is highly influenced by network effects. As a token holder, game devs, players, marketers and other investors have the potential to gain from any appreciation in the currency. Generally, the more market participants using the platform the more value is created for the token holders. With the costs distributed evenly among users, the overhead of content producers should be significantly reduced. All members, therefore, have more of an incentive to promote the system and benefit from reduced costs, higher revenue, and potential token appreciation. These network effects and low commissions are motivating the migration across content platforms, from example, from YouTube to Fixxo and Amazon to Alicoin. More specifically, we can measure the network effect according to Metcalfe’s Law — the value of a network proportional to the square of the number of its nodes. Metcalfe’s Law has shown to be an accurate predictor of the valuation, overvaluation and undervaluation of cryptocurrencies. This same metric has shown to be a proxy for the value of social media networks. Network effects are also important for Type III tokens, but importantly, asset value can be used. A token’s value is represented by the total value of an asset divided by the number of tokens outstanding. Since most token issuance is finite, as the activity in the network increases (active users, revenue), the value of the network should increase. N etwork effects are inextricably linked to the effectiveness of the protocol. The protocol encodes the platform rules and incentive system used to motivate the use of the platform. If Tom’s favorite game developer is on XYZ platform, Tom is likely to follow him. But how developers and players are incentivized to play on the platform will ultimately influence whether they stay or take their game concepts and assets to another gaming dapp with higher shared value. The viability of the hundreds of tokens and their incentive mechanisms is the great unknown in these early days of the dapp world. As platform activity picks up, winners and losers will quickly be identified. Therefore, Tom, who undoutedly wants to avoid another failure, also needs to consider the protocol in the token valuation. Once again, the key metric is activity on the platform. Is revenue per platform user growing? Another measure of market activity is market value (based on supply and demand) and the velocity of the cryptocurrency, which equals the number of users and their level of activity. The economics of dapps cannot be separated from the economics of the blockchain on which they run. Only two years ago, dapps ran almost exclusively on the Ethereum network. Many new blockchain architectures have been introduced over the last year to compete with Ethereum as the preferred platform for Type III apps. These blockchains seek to provide solutions to Ethereum’s scalability problem. Blockchain speeds ranging from 15 transactions per second (tps) for Bitcoin or 1,000 tps for Ripple and Stellar to 100,000 tps for Waves will significantly change the above protocol valuation equation. Tom is more likely to be influenced by a more casual and less approximate measure of network dynamics — popularity — measured by the number of developers and users in the network. In other words, Tom will be highly influenced by the game platforms chosen by his favorite devs and peers. Most estimations of valuation are being made in the pre-ICO stage before significant network activity develops. Practically, factors that may have more weight identified by a survey of 250 token investors by the Bitcoin Market Journal include the track record of the team, the viability of the concept, market growth prospects, user adoption and buzz as key determinants of an ICO token valuation. These measures, in turn, can be predictors of the future level of network dynamics, and thus shared value creation enjoyed by Dapp market users. 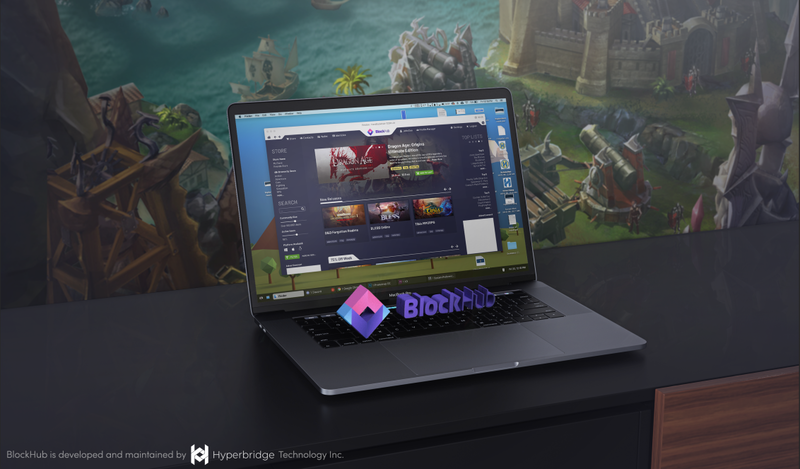 Moreover, many new gaming dapps such as Hyperbridge’s BlockHub have built-in crowdfunding mechanisms for game developers, which could help Tom keep his game development pipeline open and viable. To find out more about BlockHub, check out the whitepaper.